In 2005-06, Hispanic and black public school students were very similar in the extent of their exposure to white students. In addition, a high proportion of Hispanic and black students attended a school that had not only relatively few white students but relatively few students of any racial or ethnic identity other than their own. That is, many Hispanic students attended heavily Hispanic schools and many black students attended heavily black schools. Hispanic and black students tend to be isolated not only from white students but also from one another. In 2005-06, 56% of Hispanic students were educated in public schools that were majority Latino (Table 3). These schools educated just 3% of the nation’s white students. 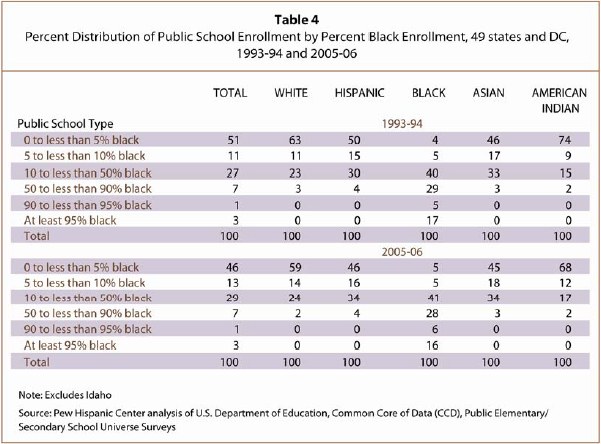 Similarly, half of the nation’s black students attended majority-black public schools in 2005-06 (Table 4). These majority-black public schools educated just 2% of the nation’s white students. Hispanics in majority-Latino schools have not only relatively few white classmates, they also have relatively few black classmates. Majority-Latino public schools educated just 7% of the nation’s black students in 2005-06. Similarly, the nation’s majority-black schools, which educate 50% of black students, educated just 4% of the nation’s Hispanic students in 2005-06. Moreover, more than one-fifth of black students attended a school in 2005-06 in which more than 90% of the students were black. These schools educate virtually none of the nation’s white students (just one-tenth of 1%) or Hispanic students (just three-tenths of 1%). Asian students were less likely than Hispanic or black students to be heavily concentrated in schools largely comprised of students of their own race and ethnicity. 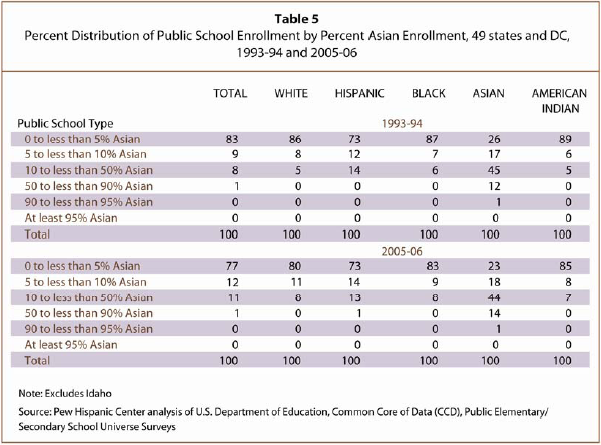 About 15% of Asian students attended majority-Asian schools in 2005-06 (Table 5).